Tomato growers of the Southern United States have often had problems with tomato spotted wilting virus, which is why BHN 1021 tomato plants were created. Interested in growing a 1021 tomato? The following article contains information on how to grow BHN 1021 tomatoes. What is a BHN 1021 Tomato? As mentioned, BHM 1021 tomato plants were developed to address the needs of southern gardeners whose tomatoes were plagued by tomato spotted wilting virus. But developers went even farther and this flavorful determinate tomato is also highly resistant to fusarium wilt, nematodes and verticillium wilt. BHM 1021 tomatoes are closely related to BHN 589 tomatoes. They produce high yields of 8-16 ounce (up to just under 0.5 kg.) red tomatoes perfect for fresh eating on sandwiches or in salads. These beauties are main season determinate tomatoes that mature in the mid to late season. Determinate means that the plant does not need pruning or support and the fruit ripens within a set time frame. Fruit is round to oval with a meaty interior pulp. When growing a 1021 tomato, or really any tomato, don’t start seeds too early or you will end up with leggy, root bound plants. Start seeds indoors 5-6 weeks prior to when the plants can be transplanted outside in your area. 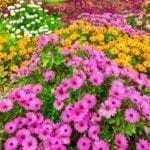 Use a soilless potting medium and sow the seeds ¼ inch deep in flat. As the seeds are germinating, keep the soil at a minimum of 75 F. (24 C.). Germination will occur between 7-14 days. When the first set of true leaves appear, transplant the seedlings into larger pots and continue to grow at 60-70 F. (16-21 C.). Keep the plants damp, not wet, and fertilize them with fish emulsion or a soluble, complete fertilizer. Transplant the seedlings into the garden in an area of full sun, planted 12-24 inches (30-61 cm.) apart. Cover the root ball well and up to the first set of leaves with soil. If you want to get a jump start, plants can be set out under floating row covers on the last frost-free date for your area. Fertilize the plants with a food that is high in phosphorous since an abundance of nitrogen spurs rampant foliage growth and leaves fruit susceptible to rot.